SIGGRAPH: Tell us a bit about the winning project you submitted. Vincent Defour (VD): This film was our graduation project. In addition to me, there were three other graphic artists and four sound artists. It took us just over one year to finish it. The story idea came bit-by-bit as we were working on the scenario throughout the first months of the project. It ended up totally different from the original concept. 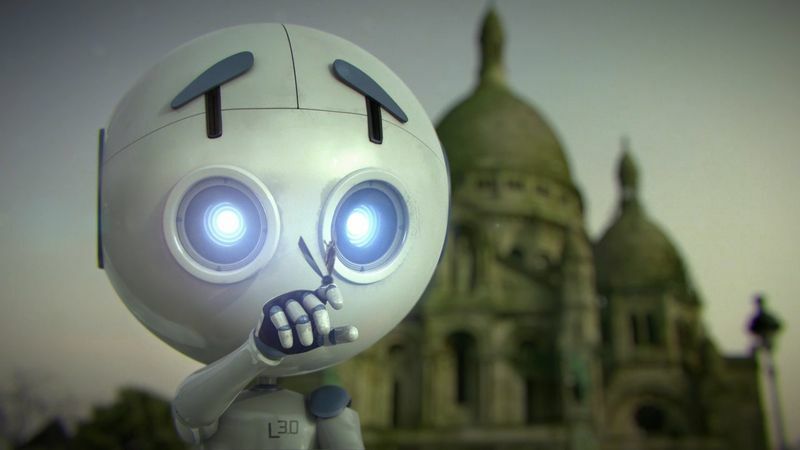 Pierre Jury (PJ): Like Vincent noted, L3.0 is a student project we made during our last year at ISART DIGITAL in Paris. We had nine months from concept (writing) to delivery. It was a truly collaborative effort among the directors — myself, Cyril Declercq, Vincent, and Alexis Decelle — and the sound design class we worked with. SIGGRAPH: Share what’s happened with the project since its debut at SIGGRAPH. VD: We didn’t expected it, but our film has been pretty well-received. It gained decent traction on the Internet in terms of reach, and continues to do so to the point that even now we occasionally receive invitations for festivals or notifications from all over the world. PJ: We had the chance to be selected and win a few other festivals around the world. We have also had the opportunity to participate in a few press interviews as well as present the project “making of” live at an event. SIGGRAPH: How did you first hear about SIGGRAPH? VD: I first heard about SIGGRAPH during my studies as it is a very well-known, respected festival in the visual effects (VFX) world. PJ: I met a student volunteer a few years back who introduced me to the event, and had the chance to be part of the wonderful student volunteer team myself in 2012. SIGGRAPH: What made you decide to submit to the SIGGRAPH Computer Animation Festival? VD: We didn’t really decide ourselves to submit our film (unfortunately). Since it was a student film, the school did the submitting work for us and sent it to a lot of different festivals. PJ: As VFX students, it was an obvious choice, thanks to encouragement from our professors. A SIGGRAPH screening is the perfect way to present work to both professional and non-professional audiences, which was really important to us. 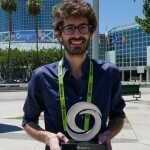 SIGGRAPH: What was your reaction when you found out you won a festival award? VD: We couldn’t believe it! Like I said previously, SIGGRAPH is a huge and famous festival, and means even more in our industry. It was an enormous (and welcome) surprise when we learned we won an award with such a prestigious festival. PJ: At the time we learned this, we had already had the good fortune of winning a few festivals in France. 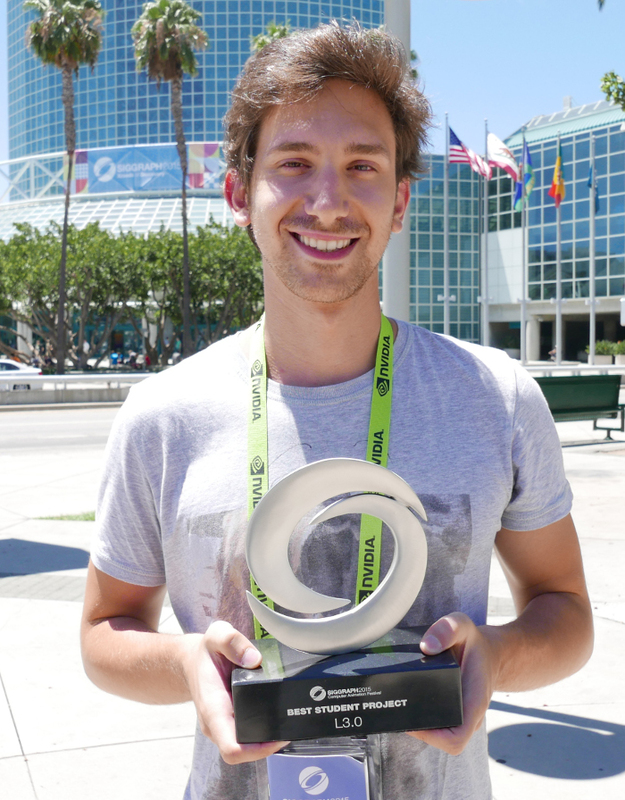 We were really proud every single time but the SIGGRAPH Computer Animation Festival “Best Student Project” award was the first international event we won. The story behind the creation of it is quite complicated and we had to fight to achieve it, so every reward means a lot to me. I was amazed to have been selected and never imagined we could win something. When the school informed us about the reward, I first thought it was a mistake. 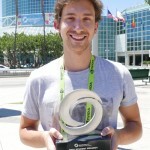 SIGGRAPH: How do you think winning a SIGGRAPH award affected your career path post-graduation? VD: I think winning this award affected my career in that it gave us pretty good visibility in the eyes of recruiters and other professionals. After the end of my studies, I did not have to search or wait very long to find my first job. I am sure SIGGRAPH was a big part of that, especially compared to the time I noticed it took some of my peers to be hired. PJ: When I graduated from ISART DIGITAL as a digital FX 3D major, I chose to stay in France, where SIGGRAPH has a notably smaller audience (as opposed to internationally). I have not had the opportunity to discuss my career path with people I met during our SIGGRAPH adventure but am considering working abroad in the future and do hope my association with SIGGRAPH could help. L3.0 (2014) from ISART DIGITAL on Vimeo. VD: I am currently working for the Technicolor company as a computer graphics (CG) generalist and developer. I do rendering and compositing but also develop tools (or upgrade old ones) for the team. PJ: I am currently working at Mikros Image in Paris as a CG generalist, mainly on lighting and compositing for commercials. I have also been working with Unit Image lately as a digital compositor. 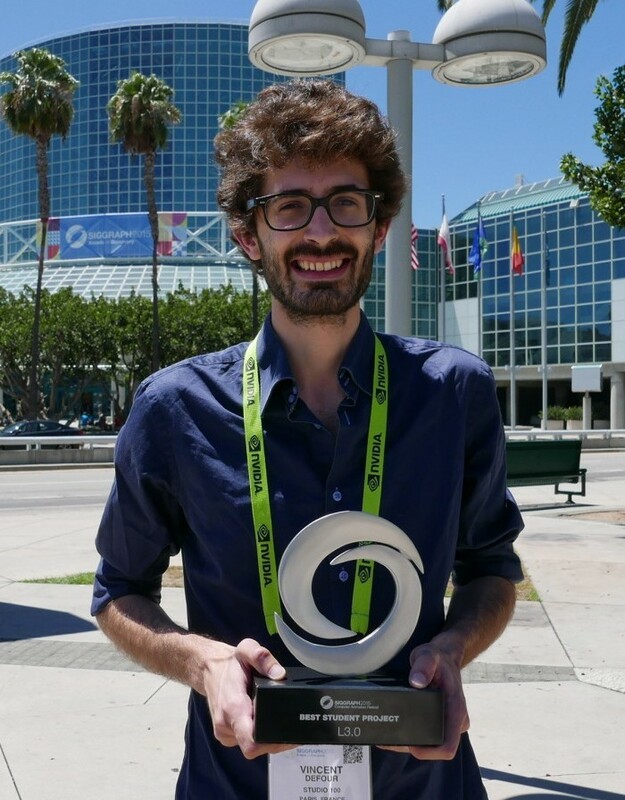 SIGGRAPH: Since SIGGRAPH, what has been your most exciting career accomplishment and why? VD: I think my most exciting career accomplishment since SIGGRAPH was to become truly accepted as a developer since originally I was, 100 percent, a graphic artist (“graphist”). I have slowly learned coding on my own over the years (mostly Python) and had the luck to work with companies that given me the chance to use and develop that skill to the point that now I am on my way to becoming an R&D developer. PJ: I have been part of the compositing team nominated for the Visual Effects Society (VES) Outstanding Compositing in a Photoreal Commercial 2017 for work on a Canal Kitchen commercial. SIGGRAPH: What is your best advice for someone pursuing a career in animation and production? VD: Don’t give up! It will not be easy, a lot of people underestimate the amount of work we have to do to achieve a nice, pretty image. But again, don’t give up! If you are passionate, it will really be worth in the end. PJ: I only know the French industry so i could not give that much of advice to international students; however, I feel like the most important thing is to keep learning from others, whether from colleagues or people you meet on the Internet, and to maintain curiosity by asking people for tips or reviews of your work in order to improve faster. SIGGRAPH: Share your favorite story from the production of your animated short. VD: I crafted all origami as references before 3D modeling (except the human, for which I have only made the 3D version). You can call me “The Origami Master” now! PJ: A few shots have been recorded in Montmartre, which is an emblematic place in Paris. All day long, the place is massively crowded and we had to film really early in the morning in order to avoid people. I discovered a magic time, lit by the first rays of the sun, quiet, and far from the usual busyness of Montmartre. Vincent Defour (left) is a computer graphics (CG) generalist and developer with Technicolor in France. He enjoys rendering and compositing and also works to develop new tools — or upgrade old ones. Pierre Jury (right) is 26 years old and has been working as a VFX artist in Paris since 2014. He began his studies in France, majoring in mechanical engineering. He soon switched to 3D as a primary area of study, which sent him to Montreal, Canada for a 1-year program at Inter-Dec College. Jury finished his studies at ISART DIGITAL, during which time he first volunteered for SIGGRAPH as student volunteer in 2012.